Gandy’s 45-lb., and 100-lb. 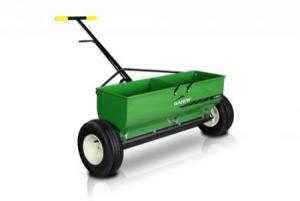 capacity Multi-Purpose hoppers allow you to apply fertilizer, seed or chemical. Unit can easily be configured from one to four outlets and comes with black metering wheels for small seed and granular chemicals; red metering wheels for small grains and fertilizer and yellow high-output metering wheels for fertilizer. It is equipped with a stainless steel metering housing and a standard bolt-in agitator to assist in product flow. A U-frame mounting bracket is included to allow for easy surface mounting. 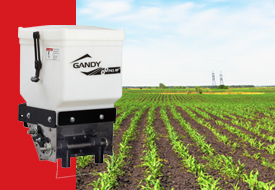 Gandy offers a number of Agricultural Delivery Systems for granular herbicides, pesticides, seeds, lime and forage preservatives. 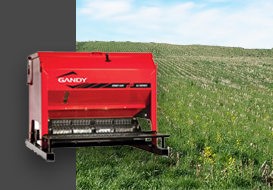 Protect and enhance your soil quality with a cover crop seeder ranging from 10 cu ft (8 bushels) to 100 cu ft (80 bushels) from Gandy. 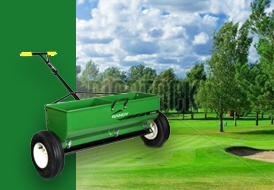 Gandy offers a line of lawn spreaders, lawn rollers, aerators, overseeders, dethachers and turf brushes.